My entire lifetime has been lived during a sort of golden age of children’s book illustration and I’ve been very interested in their art since I was a child myself. The Little Golden Books of the 40s and 50s employed wonderful artists, both from the USA and from the pool of those who began their lives in Europe and emigrated to the USA, often because they saw what was happening under Nazi Germany. Think of Garth Williams, Eloise Wilkins and Alice and Martin Provensen. And consider Georges Duplaix, Feodor Rojankovsky and wonderful Tibor Gergely. If you don’t know them, perhaps you can google their images. They had such distinctive styles. 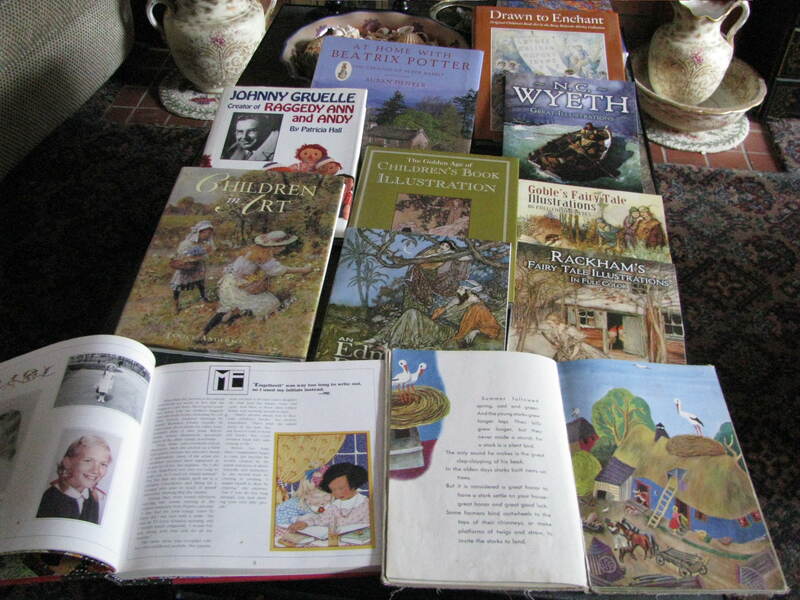 For years, since the 80s, I’ve been collecting books about Children’s book illustrator’s and their art. I think one of the first books I discovered was Mary Engelbreit’s book about her own art, Art and the Artist which came out in ’96. I had had books about children’s book illustration before this, but none about a specific artist. That Christmas Paul gave me a surprising amount of money to use as I pleased and I bought all books with it, on this topic! I wrote down in the beginning of these books when I bought them and that they came from Paul’s gift. 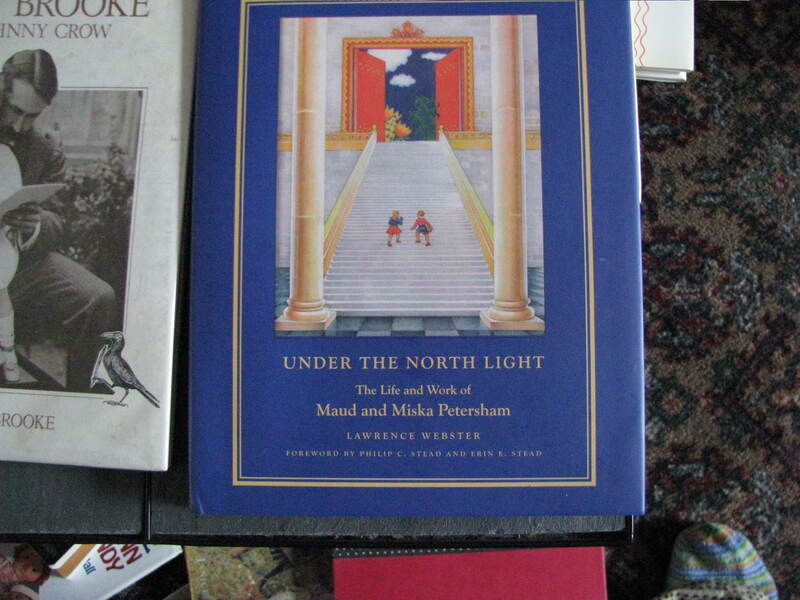 I just added another book to this collection, Under the North Light about the lives and the work of Maud and Miska Petersham. And I tracked down an old copy of their early book Miki which came out in 1929, the year one of my brothers in law (and not the oldest one) was born. I wish I had known of this book years and years ago. It is full of wonderful Hungarian influenced art and I had a nephew named Miki. The work of this couple, one a Mayflower descendant and the other a recent immigrant from Hungary and England, is a joy to look at. Before I read this book, I had wondered for a long time about the name Miska Petersham. Miska (pronounced Mishka) was obviously Hungarian, but Petersham? It obviously was not, and I couldn’t think of a name that could translate to anything like this. I was really amused to learn that Miska’s surname in Hungarian was “Petrezselyem” which means “parsley”. When he lived in England a friend suggested Petersham as beginning with the same letter and sounding better! But I rather like the name Miska Parsley. If you click on my photos they will enlarge. 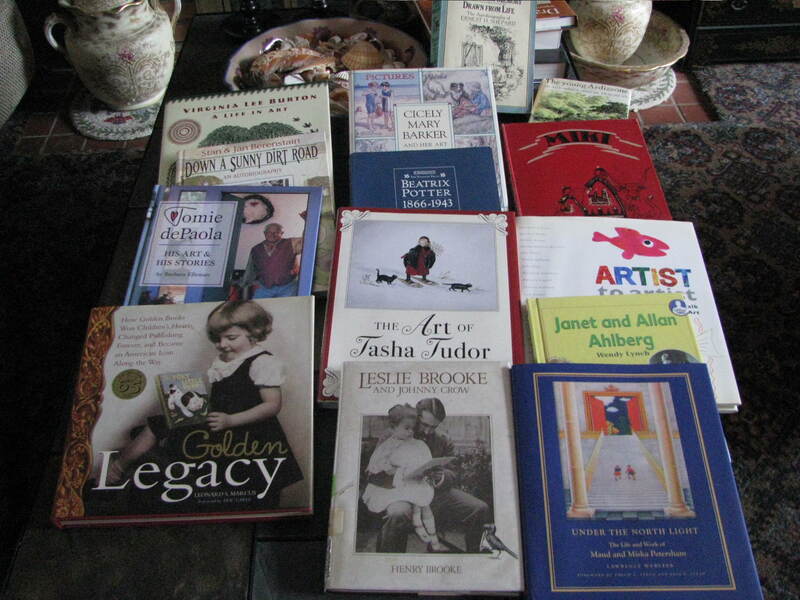 In fact, you should be able to do this twice and read the names of the artists of whom I have books. (And these are not all I have!) This is a collection that gives me a lot of happiness, especially on a darkish winter day! And since I was photographing them on the cocktail table in the living room, just below the fireplace and mantle, here is a picture of that, with some of my mother’s figurines there at the moment. Something else that makes me happy. p.s. 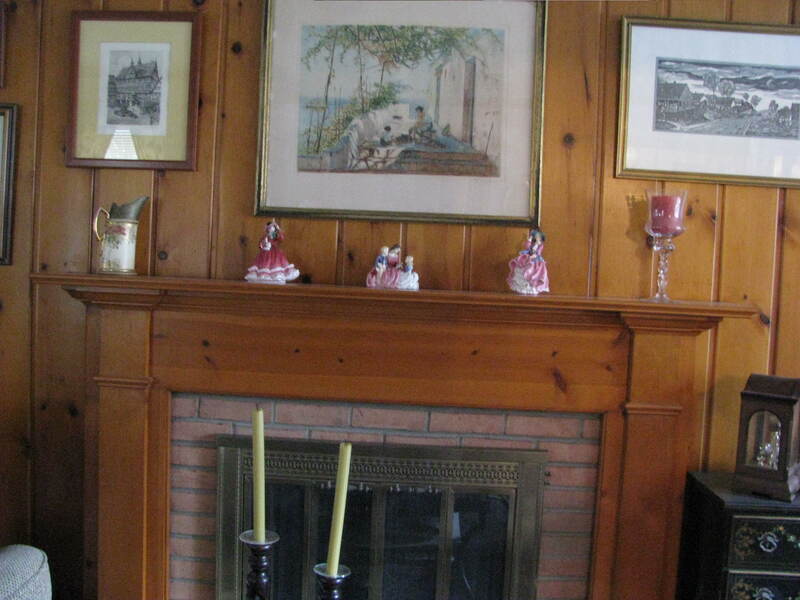 Do you notice the print just above the fireplace – the one that looks like a villa on the riviera? My Uncle Bill who fought in WWI brought it back from France in 1918 and later gave it to my parents in 1936 as a wedding gift. I’ve lived with it all my life but can find out nothing about the artist. A friend from a book discussion list who owned the Granger Collection, a media library in New York, tried to help me find out something, but could not. He said there were many artists who fled Russia in those days and were perhaps always unknown. 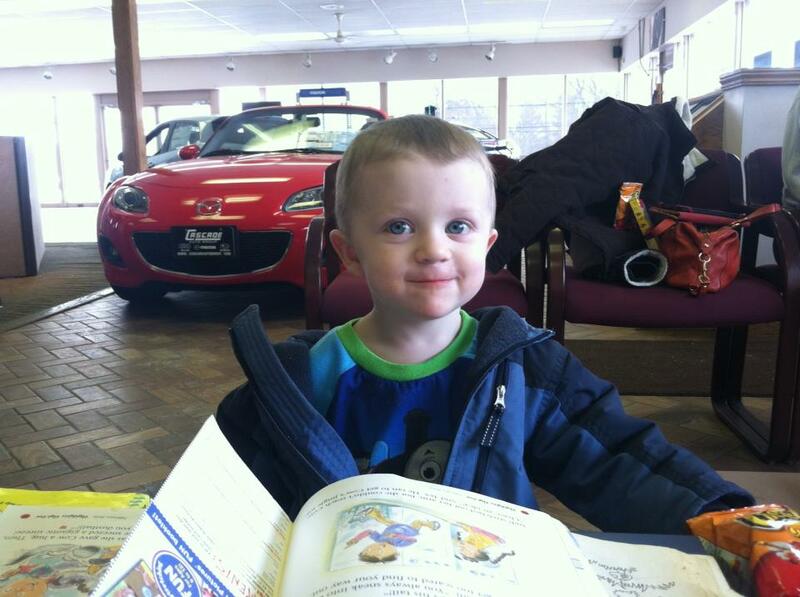 The first picture was taken yesterday when Alice and Stephen were at a local car dealership for some headlight repairs. They don’t have two year old boys there often and he was completely spoiled with crayons, candy, chips and attention! The second is from the Scout’s Pinewood Derby Banquet where Nathan moved from being a Wolf Scout to a Bear Scout………. 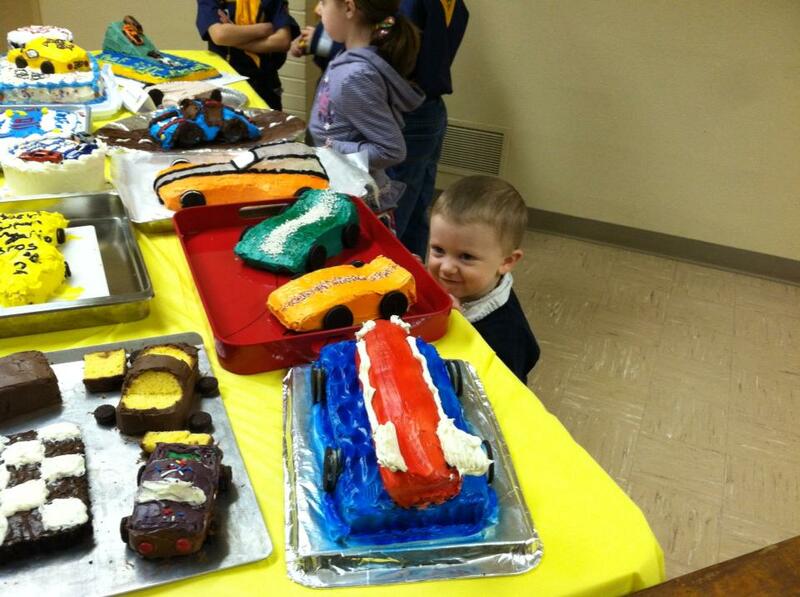 Alice baked the two cakes in the red tray in loaf pans and sculpted them to resemble the cars the boys made for the contest. Did I mention they call Stephen “the cake stalker”? Success. It is a picture and not just rubbish. 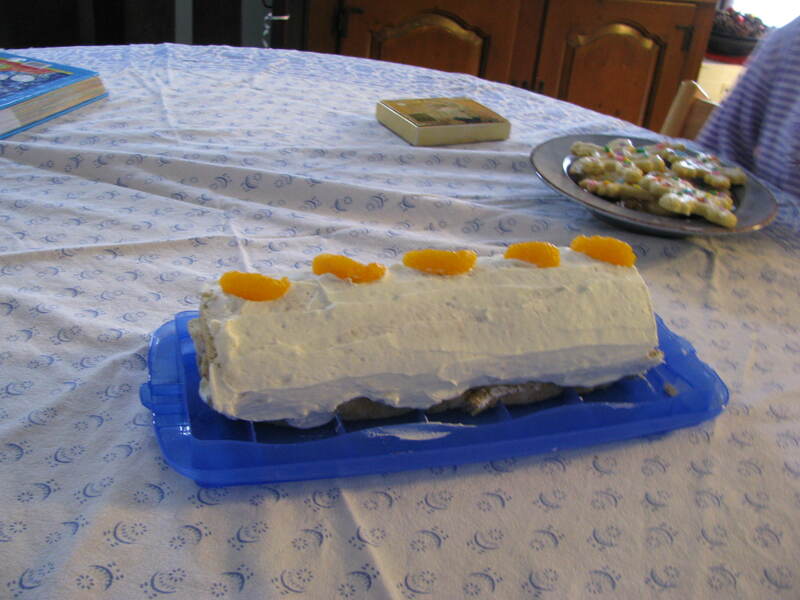 I will try and upload photos of the wonderful no carb (just about) birthday cake my clever son in law Ingmar made for me with almond meal instead of flour and splenda instead of sugar. It was so delicious. The filling was cream cheese with a little milk and more splenda and some clementine slices. Almost all the pictures with people in them were wacky. I almost have to wonder whether I didn’t have the setting accidentally in the wrong place. 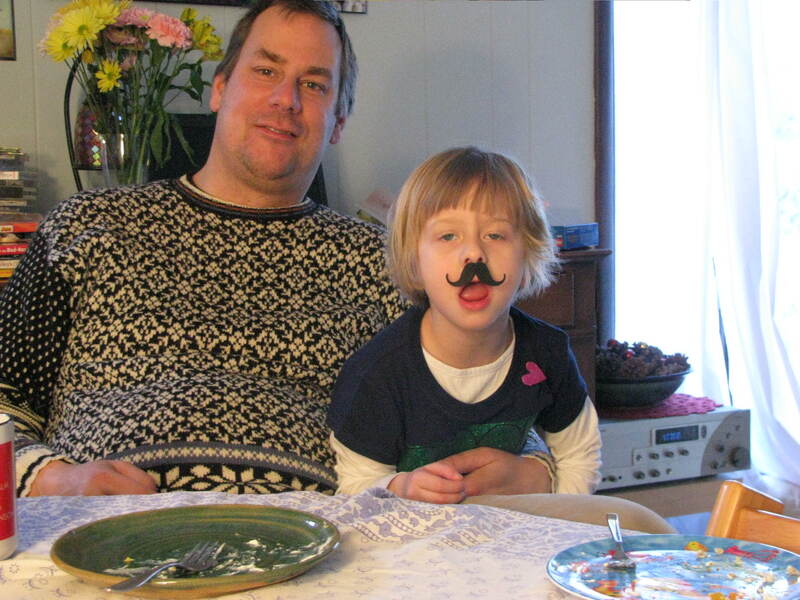 Sofia had some foam mustaches which she first put on herself and later on everyone there. A very good time was had by all. It’s been too long since I last posted anything here. I was thinking about perhaps blogging no more, but I think I enjoy doing it, even in my slow way. I had a lovely birthday weekend with my daughter and her family. 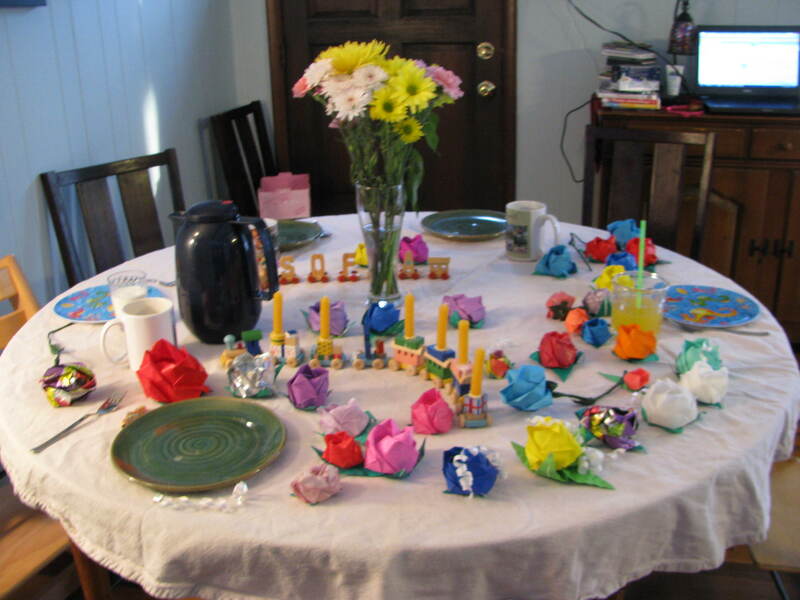 In German fashion they began celebrating with breakfast, and I hope I have uploaded a picture of the birthday table with the trains Sofia and Clara used to decorate it with, and not a series of strange letters and symbols as it is showing up on the wordpress page. We visited a wonderful maritime museum and I took lots of rather dreadful photos. And I’m afraid it feels a rather long time ago. I have something else I want to blog about and in a week I’m leaving for a month in Venice, Florida. I’m going to test this now by publishing it.